Martial's upturn in form has come amid reports of a rift with Mourinho, who fined the player in pre-season after he returned late to their tour of the United States following the birth of his second child. His agent even claimed that Martial was looking to leave the club in June, with his lack of regular first-team football last season costing him a place in France's World Cup squad. 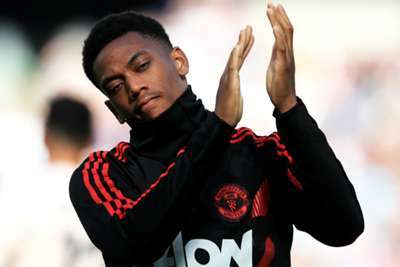 But Martial, who has played in six of United's nine Premier League games in 2018-19, has dismissed talk that he does not get on with his manager. "Things were not tense between us to begin with," the 22-year-old said to reporters following the 2-2 draw with Chelsea. "We have a player-coach relationship and I hope that we will continue like that and bring Manchester United as much as possible." Martial's double looked to have secured a win for United on Saturday until Ross Barkley struck in the sixth minute of injury time. "We were not doing well," he said. "However, we worked hard and this sort of match enabled us to show that we are a good team. "We want to continue with another good game against Juventus on Tuesday. "[The goals] have done me the world of good. However, ultimately, I am disappointed. We deserved to win but we shipped the goal in the last minute and it cost us."